Andrey Gennadyevich Karlov, the Russian ambassador to Turkey has been shot dead while speaking at an art exhibition in the Turkish capital, the Russian Foreign Ministry, has confirmed. Foreign Ministry spokeswoman Maria Zakharova made the announcement in a live televised statement, Sky News reports. She said, “Today in Ankara, as a result of an attack, the ambassador of the Russian Federation to Turkey, Andrey Gennadyevich Karlov, received a wound from which he died. The 62-year-old ambassador had been attending an art exhibition at the Contemporary Arts Centre in the Cankaya area of Ankara, along with other dignitaries and media. The gunman was Mevlut Mert Altintas, a 22-year-old who had been working for the riot police squad in Ankara for the past two-and-a-half years. He was off-duty when it was understood he entered the building using his police ID and opened fire on the ambassador as he made a speech. A video showed him shouting, “Don’t forget Aleppo, don’t forget Syria! So long as our brothers are not in safety, you will not taste safety either. Only my dead body will leave here. The gunman also shot three other people, although none were seriously injured, according to Turkey’s interior ministry. Turkish media said he then climbed to the second floor of the building before a 15-minute shootout with police, during which he was killed. 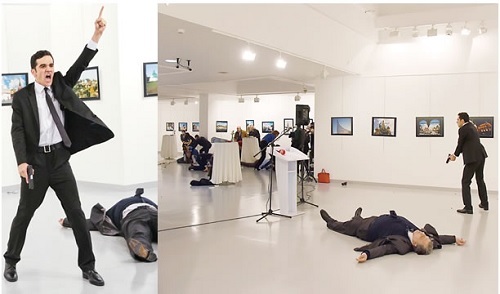 A photographer from Associated Press who had been at the exhibition said the gunman had been wearing a suit and tie and had shouted “Allahu Akbar” before firing at least eight shots. He had also spoken in Russian and smashed several of the photos in the exhibition.